Today, you get a 2-for-1 special for the Name(s) of the Day. I've recently had a new-found fascination with the name Millicent but it just feels a bit too old-fashioned and stiff for me to personally consider using. I decided to look at variations of it and fell in love with the French Melisande, which I would use in a heartbeat if I could get hubby on-board since he speaks French and I'm learning it. 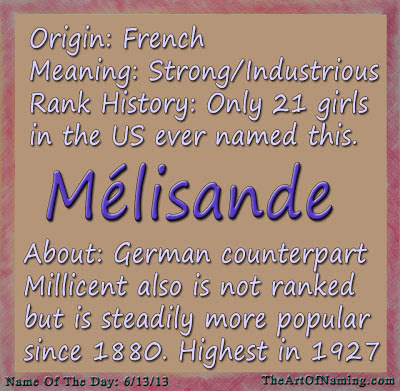 When I went to look up the popularity stats on these names that I hear quite frequently on naming forums, I was surprised to see how little-used and extremely rare Melisande is in the US. Check this out! 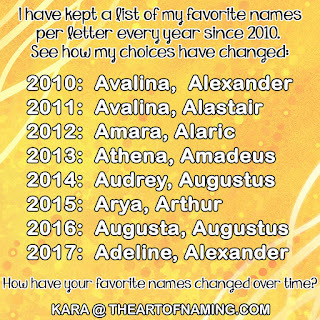 The data pool that I use doesn't record a name for the year if there were not at least 5 births. So perhaps there have been 1-4 births here and there all along, but according to this data, there were 5 girls named Melisande in 2005 (ranked #18226), 6 in 1972, 5 in 1960, 5 in 1947 and that is all! 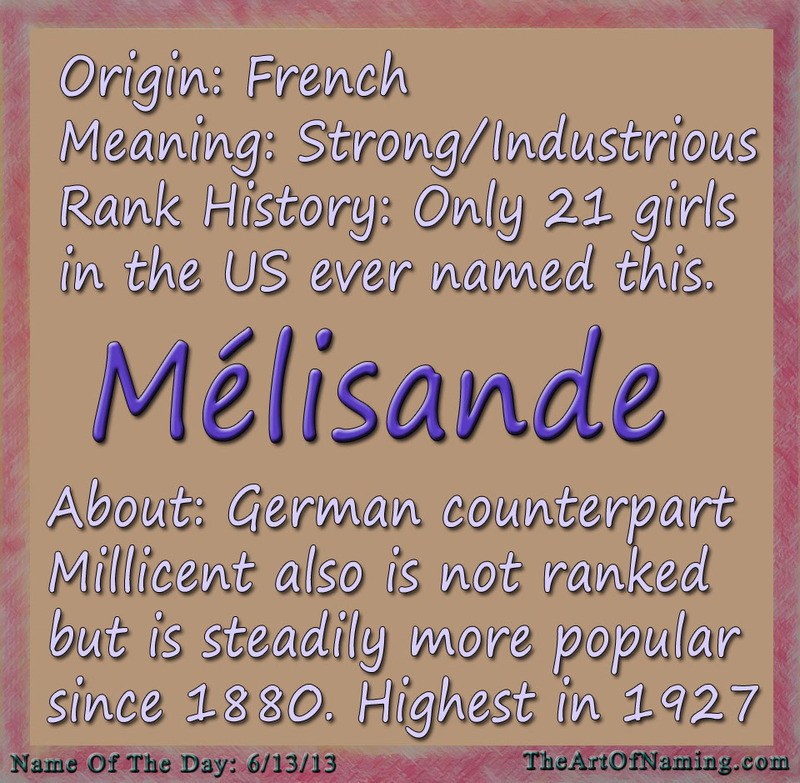 A total of 21 little girls named Melisande in the US EVER! How much more unique could you get? Yet the name sounds familiar as if you should know a Melisande or two. Millicent, however, has been steadily popular since the SSA began ranking names in 1880. There was a peak of 249 girls named Millicent in 1927 (which is its highest chart ranking of #435) and it has never reached that many since then. 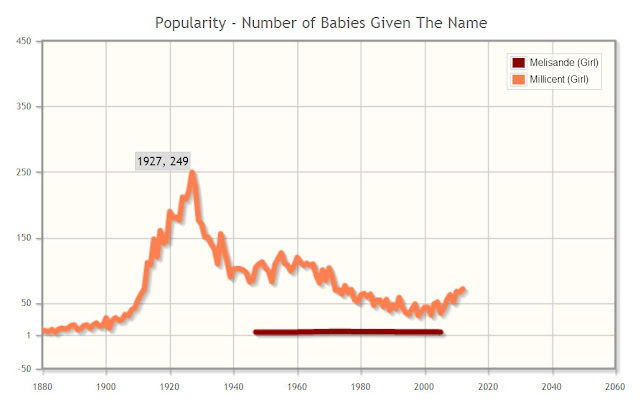 In 2012, there were 71 baby Millicents which ranked the name at #2539. Both names are rarely heard of today and would be refreshing and adorable! Millicent could go by Millie, and Melisande could be Mellie or Sandy or even Lissy or Andy if you go by spelling instead of sound. (Remember, it has a French pronunciation which roughly sounds like "mehl-ee-sahnd.) See the popularity of Melisande in France here. Both names mean "Strong" or "Industrious". Melisande is French and Millicent is German. Melisande was used by Maurice Maeterlinck in his play 'Pelléas et Mélisande' (1893). The play was later adapted by Claude Debussy into an opera (1902). What do you think of these non-ranking names? Too old-fashioned, or perfectly unique and beautiful?